Shepolopolo launched the 2018 COSAFA Women’s Cup with a 2-0 win over Lesotho on Thursday in a Group B match played in Port Elizabeth, South Africa. Skipper Misozi Zulu and star striker Barbra Banda scored in each half as Shepolopolo overcame Lesotho. Zulu put Zambia in front after 36 minutes with Banda’s goal coming 12 minutes after the half time break. Banda was later voted player of the match. 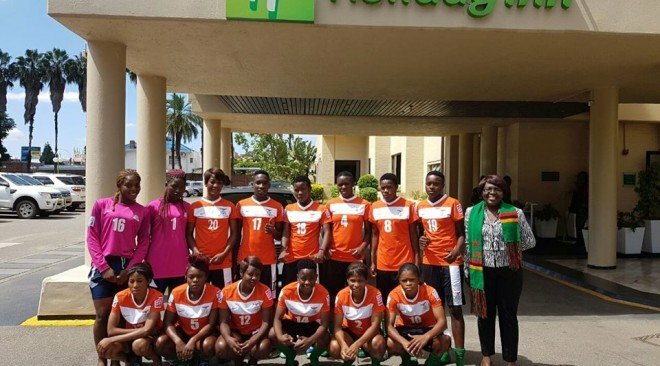 Zambia coach Beauty Mwamba started with Hazel Nali in goal with Margret Belemu, Martha Tembo, Jacqueline Nkole and Anita Mulenga manning the defence. Rhoda Chileshe, Misozi, Zulu, Hellen Chanda marshaled the midfield with Barbra Banda leading the attack alongside Rachael Nachula and Mary Mwakapila. Meanwhile, Zambia’s next match is against Group B leaders Cameroon on Saturday. Guest side Cameroon are leading the group after thumping Mozambique 8-1 in their opening match earlier on Thursday. “If HH were Shepolopolo Coach they could have won the World Cup at least ten times,” Larry Mweetwa. CHILDISH. Go Shipolopolo and gun down every opponent violating your path to glory. Well done our ladies, Zambians are so proud of you.